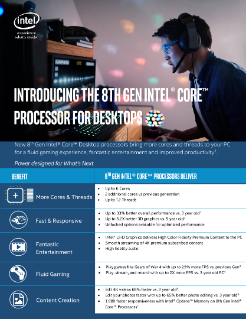 Use this guide to communicate the benefits of 8th Gen Intel® Core™ processors to your customers. Discover the new Intel® architecture, enabling a razor-thin laptop that meets a blazing-fast tablet. Upgrade to the latest devices based on 6th generation Intel® Core™ processors. Watch this video to learn how Intel® Technology Provider partners are benefiting from Intel® Channel training. Learn how Intel® Provider Partners can unlock Specialty Benefits to grow their business. Learn about the benefits of Intel® Technology Provider. Why Buy from an Intel® Technology Provider Cloud Data Center Specialist?